WHAT IS IT? The Model RSB is a heavy-duty safety control ("stop switch") that provides a positive shut off of dangerous equipment in an emergency. A cable pulled by endangered personnel actuates it. The output contacts of the Model RS can control up to two separate circuits, one for machinery shutdown and one for an alarm.The Model RSB has the built-in advantage of cable break detection. WHY IS IT NECESSARY? Safety minded operators of conveyors, production lines, elevator equipment, assembly lines, material handling systems, cranes, etc. consider it a must for employee protection. Most states have safety statutes that require these switches on conveyors and related equipment. American National Standard Institute recommends their use in ANSI standard No. ASME B20.1-2012-5.11. This ANSI standard will probably soon become part of the William-Steiger Act of 1970- the OSHA act. Note: Turnbuckle and spring tension kit (RSB-20) included with each RSB unit. Optional LED (120 VAC) bulb for model RSB-2L or RSB-5L: add $37.00 per unit, add "LED" to end of model number. The housing is cast aluminum, with optional epoxy or polyester powder coatings available (for additional corrosion resistance). The unit must be installed with pull cable on both sides of the unit (+/-5 feet each side) and can be actuated via a cable pull from either or both directions on every unit; in other words, the unit is "double ended" (only). Special spring tensioning kits included with each RSB unit provide stability due to temperature fluctuations, and ease of cable adjustment. The functional ambient temperature is -50° to 85° C [-58° to 185° F]. The general purpose units are rated NEMA type 4/4X weatherproof and corrosion-resistant. Explosion proof units are rated NEMA type 7/9 for dust ignition proof and vapor explosion proof. 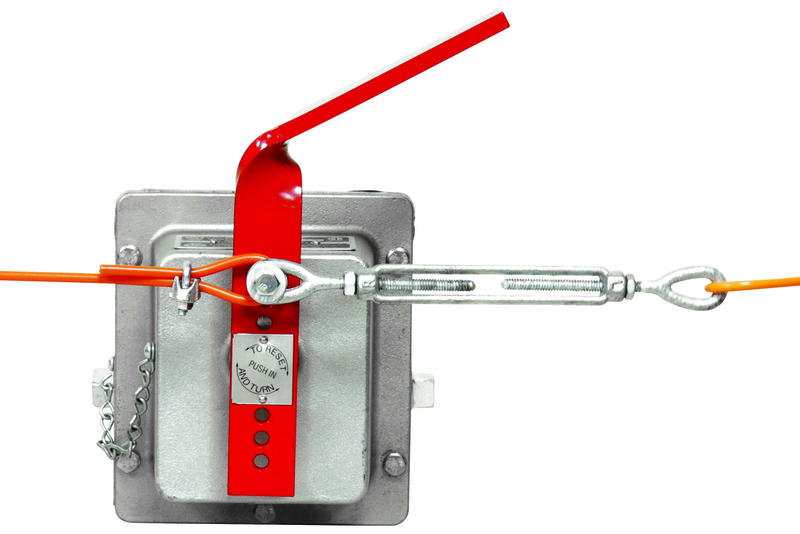 The dual-rated "D" units are rated NEMA type 4 weatherproof and NEMA type 9 dust ignition proof. The general purpose controls are IP65 compliant. All RSB models are UL listed except RSB-3, RSB-7 and RSB-8. Models RSB-1, RSB-2, RSB-2L, RSB-4, RSB-4L, RSB-5 and RSB-5L are CSA certified. Models RSB-1X, RSB-2X, RSB-4X and RSB-5X are CSA certified.